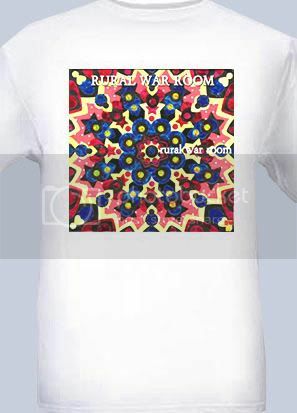 SHIPPING NOW, the Moog club mixes and live cuts on the CD, Rural War Room EP (2007 RWR) in two clicks below. Italian Theremin master and RWR collaborator ErMan has done the primary 12" remix of the song in association with Timeless Sonic Factory aka TSF. Also included on this new EP are three more club mixes, cuts from Pod Jam 4 Nagoya, Japan and live cuts from the 2007 Not Fest in Little Rock, Arkansas. To buy the CD for $12 USD postage paid, NOW with Paypal, click below. To buy the virtual EP from iTunes, click below. 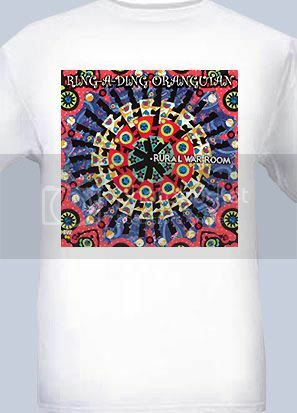 Get the limited edition RURAL WAR ROOM T-Shirts featuring the original hole-punched gift wrap mandala print by Byron Werner. Boggle the minds and eyes of friends with this mandala made from hole-punched gift wrap by Byron Werner. Only $13 each postage paid - Cheaper here than in stores! They come in majestic white. SM, M, L, XL, XXL. All shirts are designed to make you look your psychedelic best! * No thick plastic on your fabric! Get the classic Ring-A-Ding Orangutan t-shirt also featuring the original hole-punched gift wrap mandala print by Byron Werner. Only $13 each postage paid! They come in majestic white - don't be afraid. SM, M, L, XL, XXL. Britney pink is back! Scroll down for details. Order yours for the holidays by clicking the shirt of your choice. The Britney Pink-Tee is back! Order yours for the holidays by clicking the shirt. It's that easy!